Optimum have re-scheduled a few titles: their Rashomon Special Edition will be released "this year"; Paul Greengrass' Bloody Sunday and Omagh have moved to March the 3rd. New recruit Graves has been giving our Incoming listings for Blu-ray and HD DVD a thorough (and long overdue) overhaul. It's an area we've neglected somewhat, but the recent updates have brought everything up to date. I'd even go so far to say that our listings, particularly for Blu-ray, are now virtually definitive. You'll find listings of forthcoming Blu-ray titles here, and forthcoming HD DVD titles here. You can also search for catalogue titles from the main Incoming page. Everyone knows that Play.com have a buy-two-get-one-free offer on Blu-ray titles at the moment, right? An abridged reading of the autobiography of John Barrowman, star of Doctor Who and its spin-off series Torchwood, judge on BBC1's top-rating talent shows How Do You Solve a Problem Like Maria? and Any Dream Will Do, and all-round star of stage and screen. It is the life story of one of show business's best-loved figures. Anything Goes traces John's life from his Glaswegian childhood and American adolescence, this no-holds-barred insight into the career of a multi-talented star includes his first big break (when he triumphed in an Anything Goes open casting to star opposite theatre legend Elaine Paige), his unmatched West End achievement, his move into American primetime television, his success in films such as De-Lovely and The Producers: and his current mainstream appeal as the hottest talent on the BBC. 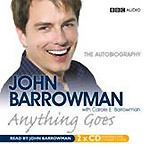 Anything Goes, read by John Barrowman, was written in collaboration with his sister Carole E. Barrowman. New additions to the Incoming database this week include Resident Evil 3: Extinction; the Life on Mars sequel Ashes To Ashes; and Tom DiCillo's cult comedy Living in Oblivion. Details of the first Masters of Science Fiction DVD set have also been added, among others. The Spooks - Series 6 set has been delayed indefinitely from its original February 25th release date.